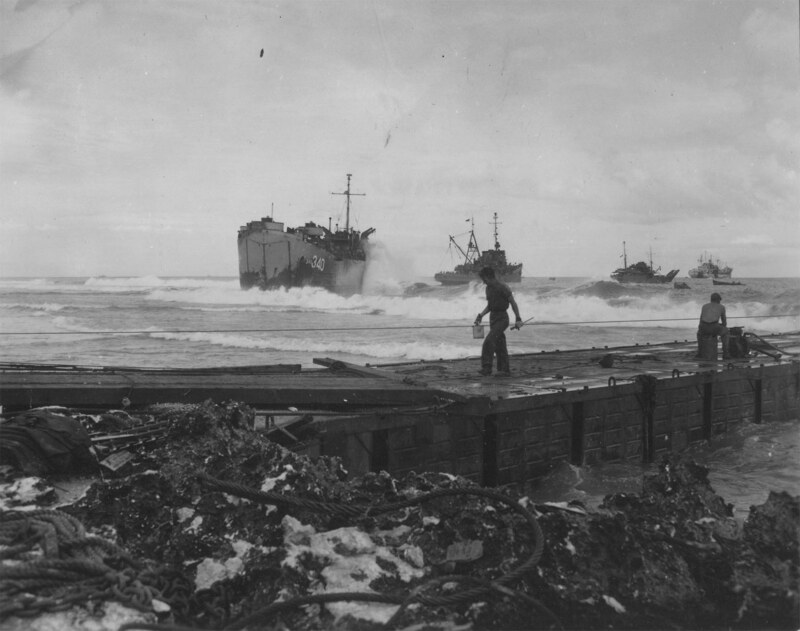 On July 29 1944, USS LST-340 was pushed up on to a reef and stranded at "White Beach 2" on Tinian Island. 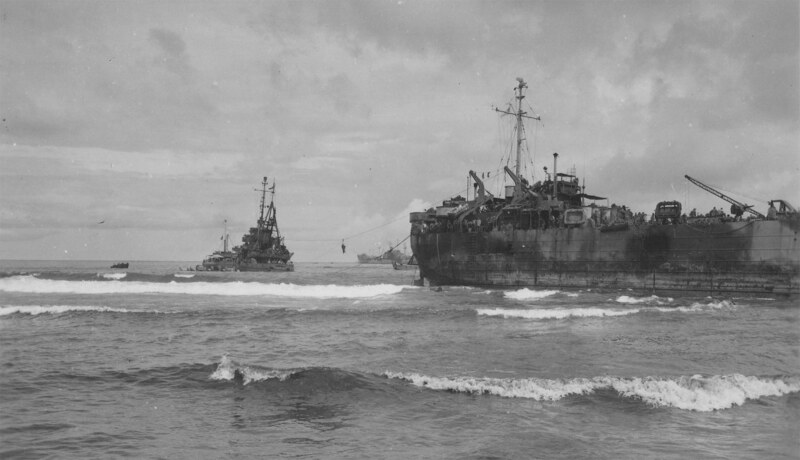 She had dropped off 24 trucks and drivers at the temporary pier visible in 80-G-284218 and picked up a large number of US casualties who were being evacuated for medical treatment. While retracting from the beach large waves and winds from the edges of a typhoon broached the ship and then ran her hard aground on the reef. Her starboard propeller shaft was knocked five inches out of alignment and the main engine room flooded beyond control - the auxiliary engine room was flooded two feet deep with a four foot coralhead intruding through a hole punched through the ship's hull. The wind and waves were so strong that the temporary pier on the beach nearby was broken apart later that evening and destroyed, leaving the beachhead serviceable only by DUKWs and LVTs. Boats from USS Cambria (APA-36) were initially sent to assist the next day but the surf was still too rough to transfer the wounded solders. The task then fell to the time-tested but unnerving Breeches Buoy. 160 casualties were removed one at a time by breeches buoy to USS Chickasaw (ATF-83) over the course of eight and a half hours on July 30 and then transferred to USS LST-40. Chickasaw left to assist other vessels in need of towing services and was replaced by USS Clamp (ARS-33) who began repair and salvage operations on August 1. She was refloated early on the morning of Sunday, August 13 after nearly two week's work and towed by Chickasaw to Tanapag Harbor, Saipan. A Navy inspection revealed her to be beyond economic repair and she was turned into an unpowered barracks ship. 80-G-284213 200k USS LST-340 aground with USS Chickasaw (ATF-83) and likely USS Chichona (AN-12) during breeches buoy recovery of the casualties aboard the grounded ship. 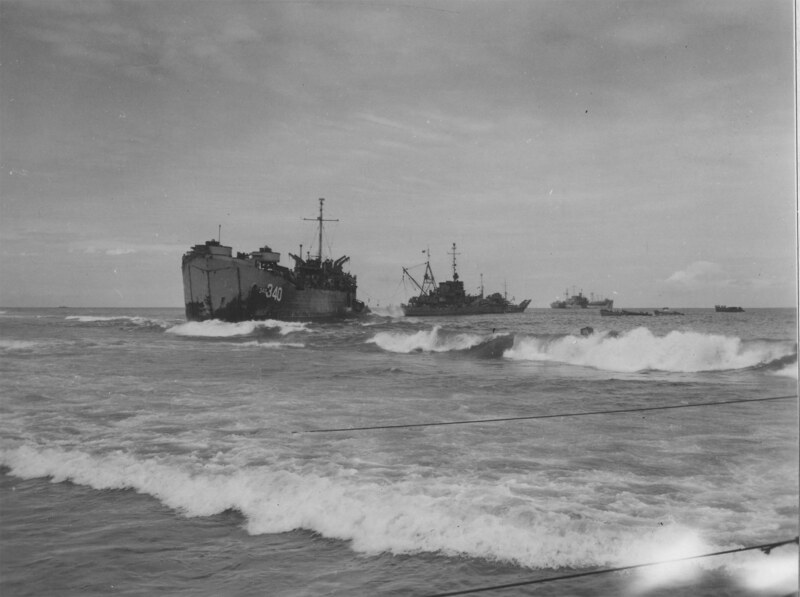 Note the LCVP rolling away from her stern as a wave passes and washes down the hull. 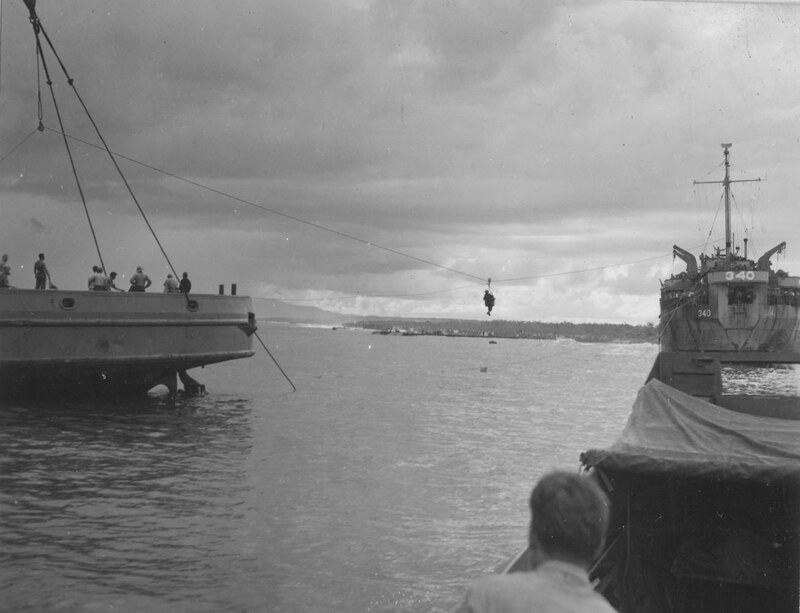 80-G-284217 102k A soldier is transferred from USS LST-340's stern to USS Chickasaw (ATF-83) via breeches buoy as seen from a LCVP. 80-G-284218 187k USS LST-340 aground with USS Chickasaw (ATF-83) and likely USS Chichona (AN-12) anchored further out. The attack transport in the distance is most likely USS Cambria (APA-36) as she was close enough that her boats responded to the grounding (and may be in view here) and the dazzle pattern matches the camouflage Measure 32 pattern 3D. 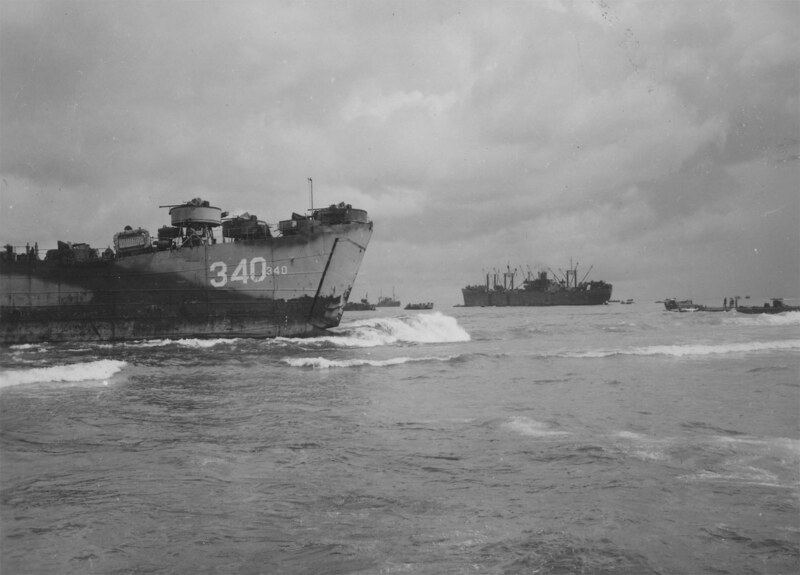 Note the wave breaking over LST-340's aft boat davit. 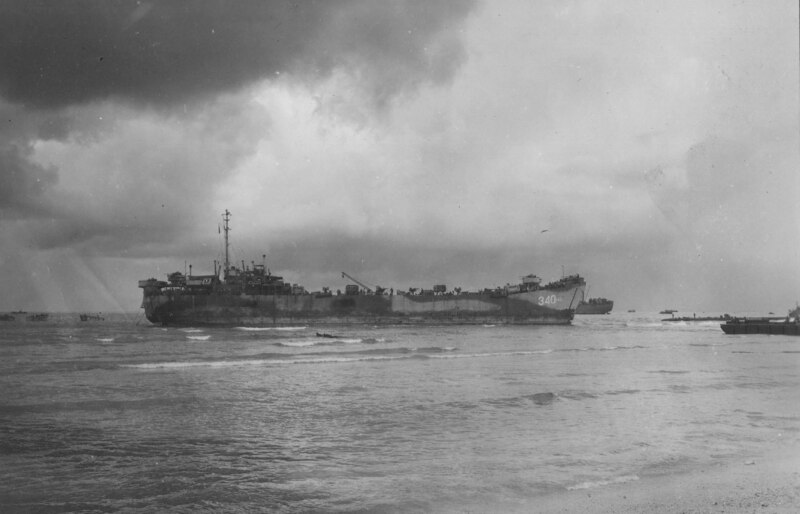 80-G-284222 160k A starboard view of USS LST-340 from the shoreline of White Beach 2 as she lay stranded on 30 July. 80-G-284223 196k USS LST-340's well-weathered aft half during breeches buoy operations on July 30. 80-G-284224 152k USS LST-340's bow when grounded showing the three forward single-barrel 40mm mounts and two of her forward 20mm mounts under protective canvas due to the weather. The two different sizes of hull number were due to different directives concerning the size of numbers on various classes of ship.